How can I plot my data? How can I save my plot for publishing? Create a time series plot showing a single data set. Create a scatter plot showing relationship between two data sets. matplotlib is the most widely used scientific plotting library in Python. 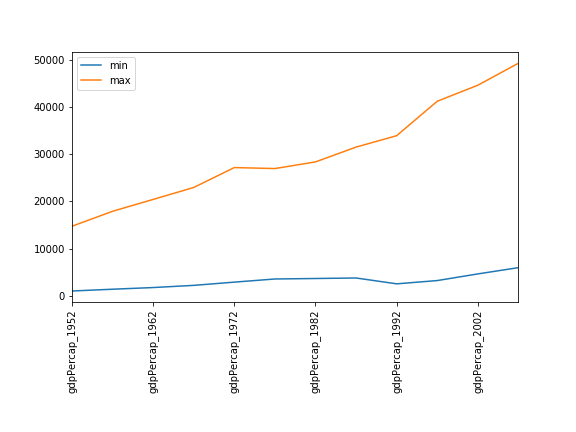 Commonly use a sub-library called matplotlib.pyplot. The Jupyter Notebook will render plots inline if we ask it to using a “magic” command. Simple plots are then (fairly) simple to create. Plot data directly from a Pandas dataframe. We can also plot Pandas dataframes. Select and transform data, then plot it. By default, DataFrame.plot plots with the rows as the X axis. We can transpose the data in order to plot multiple series. Many styles of plot are available. For example, do a bar plot using a fancier style. Data can also be plotted by calling the matplotlib plot function directly. The color / format of markers can also be specified as an optical argument: e.g. ‘b-‘ is a blue line, ‘g–’ is a green dashed line. Can plot many sets of data together. # Select two countries' worth of data. # Plot with differently-colored markers. Often when plotting multiple datasets on the same figure it is desirable to have a legend describing the data. Instruct matplotlib to create the legend. Fill in the blanks below to plot the minimum GDP per capita over time for all the countries in Europe. Modify it again to plot the maximum GDP per capita over time for Europe. Modify the example in the notes to create a scatter plot showing the relationship between the minimum and maximum GDP per capita among the countries in Asia for each year in the data set. What relationship do you see (if any)? No particular correlations can be seen between the minimum and maximum gdp values year on year. It seems the fortunes of asian countries do not rise and fall together. Seems the variability in this value is due to a sharp drop after 1972. Some geopolitics at play perhaps? Given the dominance of oil producing countries, maybe the Brent crude index would make an interesting comparison? Whilst Myanmar consistently has the lowest gdp, the highest gdb nation has varied more notably. Using online help and other resources, explain what each argument to plot does. A good place to look is the documentation for the plot function - help(data_all.plot). kind - As seen already this determines the kind of plot to be drawn. s - Details for this can be found in the documentation of plt.scatter. A single number or one value for each data point. Determines the size of the plotted points. will save the current figure to the file my_figure.png. The file format will automatically be deduced from the file name extension (other formats are pdf, ps, eps and svg). Note that functions in plt refer to a global figure variable and after a figure has been displayed to the screen (e.g. 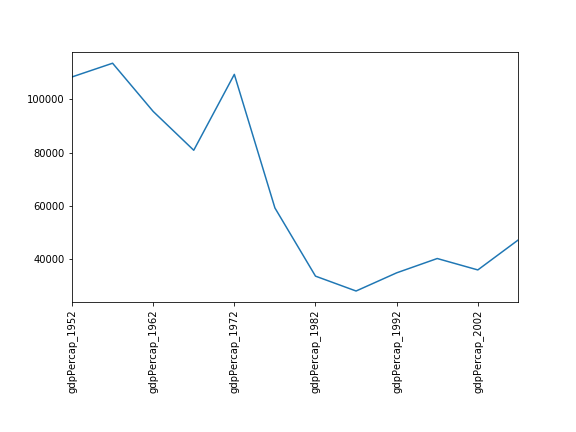 with plt.show) matplotlib will make this variable refer to a new empty figure. Therefore, make sure you call plt.savefig before the plot is displayed to the screen, otherwise you may find a file with an empty plot. call the savefig class method from that varible. Whenever you are generating plots to go into a paper or a presentation, there are a few things you can do to make sure that everyone can understand your plots. Always make sure your text is large enough to read. Use the fontsize parameter in xlabel, ylabel, title, and legend, and tick_params with labelsize to increase the text size of the numbers on your axes. Similarly, you should make your graph elements easy to see. Use s to increase the size of your scatterplot markers and linewidth to increase the sizes of your plot lines. Using color (and nothing else) to distinguish between different plot elements will make your plots unreadable to anyone who is colorblind, or who happens to have a black-and-white office printer. For lines, the linestyle parameter lets you use different types of lines. For scatterplots, marker lets you change the shape of your points. If you’re unsure about your colors, you can use Coblis or Color Oracle to simulate what your plots would look like to those with colorblindness. Many styles of plot are available: see the Python Graph Gallery for more options.